Established in 1303 as the manor of Walthamstow Sarum, the locality’s present name came into use after the late 1430s, when Sir William Tyrwhitt founded a chapel here, which adjoined his manor house of Salisbury Hall and was dedicated to Edward the Confessor. The chapel was in ruins by 1650 and attempts to rebuild it foundered. As the hamlet of Chapel End grew, a new chapel of ease was built by Lewis Vulliamy in 1830 and dedicated to St John. Vulliamy’s chapel was replaced in 1926 by the present St John’s church, which was built in response to the suburban devel­opment of the area, much of which was the work of the Warner family, Walthamstow’s pre-eminent builders. 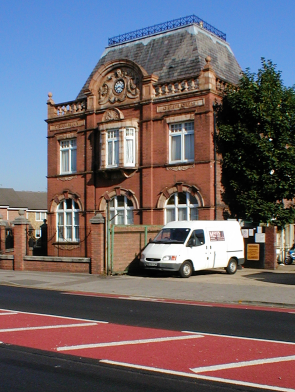 Shown in the photo above, Walthamstow tramway offices opened on Chingford Road in 1905. Its tramway routes were converted to trolleybus operation in 1936–7, and then to motor­buses in 1960. The offices are now flats. With the arrival of the North Circular Road in the late 1920s, factories were built in the north of the district, and this indus­trial zone continued to grow until the 1960s. Sports grounds occupy much of the east side of Chingford Road, together with Sir George Monoux College, formerly a grammar school and now a sixth form college. Most homes in Chapel End are owner-occupied and a high proportion of these contain dependent children. At Chapel End infants school a far higher than average proportion of pupils are from minority ethnic backgrounds, with Pakistani pupils and pupils of mixed heritage repres­enting the largest ethnic minority groups, according to Ofsted’s 2011 report. Half of the pupils speak English as an additional language, although few are at an early stage. The school was rated ‘good’ in that report, as it was when a short inspection was conducted in 2017. The author James Hilton partly modelled the protagonist of his novel Goodbye Mr Chips on his father, who was head teacher of Chapel End School. The character was also influenced by one of Hilton’s teachers at Sir George Monoux School. Other old boys of Monoux include the jazz musician Sir Johnny Dankworth and the footballer Teddy Sheringham.